McKenzie Riley’s grand champion beef steer sold for $5,000 at the Fayette County Fair Beef Steer Sale on Friday evening. Riley is pictured with buyers, family and fair royalty: (first row) Fair Attendant Susanna Eckstein, Macie Riley, Gracelyn Zimmerman, Fair Queen Marissa Sheets, Beef Queen Lindsey Worley, Sheila Johnson of Kroger, Fair Attendant Clare Sollars, Devin Bilski of Congressman Steve Stivers’ office, Fayette County Commissioner Tony Anderson, (back row) Fayette County Prosecutor Jess Weade, Shane McMahon of McMahon Insurance, Keith Tooill of McDonald’s of Fayette County, Buck Minyo of LCNB, Jim Gusweiler of Gusweiler, Travis Mick of Prime Meats, Adam Rapien and Chase Enochs of Congressman Steve Stivers’ office. Victoria Waits’ reserve grand champion beef steer sold for $2,500 at the Fayette County Fair Beef Steer Sale on Friday evening. Waits is pictured with buyers and fair royalty: (front row) Ashton Bain, Beef Queen Lindsey Worley, Fair Queen Marissa Sheets, Fair Attendant Clare Sollars, Fair Attendant Susanna Eckstein, (second row) Shane McMahon of McMahon Insurance, Daryl Waits of Fayette Veterinary Hospital, Jim Gusweiler of Gusweiler, and JL Draganic of Fayette County Cattlefeeders. 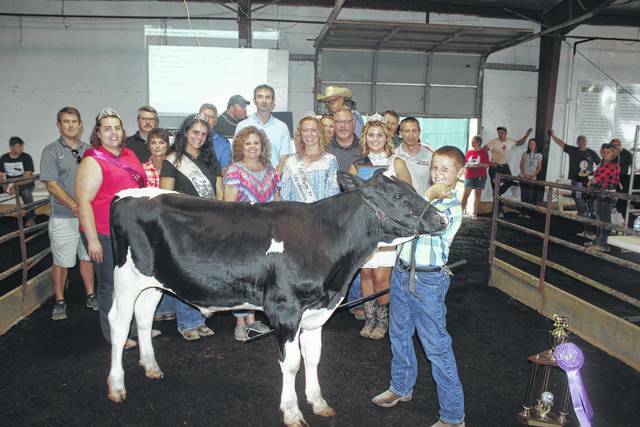 Victoria Schappacher’s grand champion dairy steer sold for $1,700 at the Fayette County Fair Dairy Steer Show on Friday evening. Schappacher is pictured with buyers and fair royalty: (front row) Dairy Princess Chloe Lambert, Fair Attendant Susanna Eckstein, Diane Faris Munro of Faris Insurance, Fair Attendant Clare Sollars, Fair Queen Marissa Sheets, Shane McMahon of State Farm, (second row) Devan Bilski of Congressman Steve Stivers’ office, Tabby Melvin of Universal Dermatology, Fayette County Prosecutor Jess Weade, Buck Minyo of LCNB, (last row) Mark Richards of First State Bank, Adam Rapien and Chase Enochs of Congressman Steve Stivers’ office, Jared Hoop of Baxla Tractor, Jim Gusweiler of Gusweiler, Ryan Garrison of Melvin Stone, Wayne Arnold of Skyline and A-1, and Travis Mick of Prime Meats. Abigail Riley’s reserve grand champion dairy steer sold for $1,600 at the Fayette County Dairy Steer Show on Friday evening. 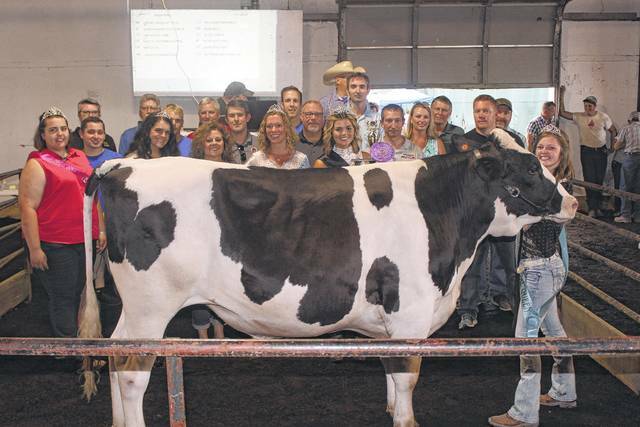 Riley is pictured with buyers and fair royalty: (front row) Dairy Princess Chloe Lambert, Fair Attendant Susanna Eckstein, Diane Faris Munro of Faris Insurance, Fair Attendant Clare Sollars, Fair Queen Marissa Sheets, (second row) Devan Bilski and Chase Enochs of Congressman Steve Stivers’ office, Ryan Garrison of Melvin Stone, Buck Minyo of LCNB, Daryl Waits of Fayette Veterinary Office, Jared Hoop of Baxla Tractor, (back row) Keith Tooill of McDonald’s of Fayette County, Mark Richards of First State Bank, Shane McMahon of State Farm Insurance, Adam Rapien of Congressman Steve Stivers’ office, Fayette County Auditor Aaron Coole, Tabby Melvin of Universal Dermatology, Wayne Arnold of A-1 and Skyline, and Travis Mick of Prime Meats. Anita Pursell’s grand champion dairy feeder sold for $1,550 at the Fayette County Fair Dairy Feeders Sale on Friday evening. Pursell is pictured with buyers and fair royalty: (front row) Dairy Princess Chloe Lambert, Barb Duncan of Merchants Bank, Debbie Havens of Havens Land, Fair Attendant Susanna Eckstein, Diane Faris Munro of Faris Insurance, Fair Attendant Clare Sollars, Fair Queen Marissa Sheets, (second row) Buck Minyo of LCNB, Daryl Waits of Fayette Veterinary Hospital, Ryan Garrison of Melvin Stone, (back row) Shane McMahon of State Farm Insurance, Mark Richards of First State Bank, Jim Gusweiler of Gusweiler, Fayette County Auditor Aaron Coole, Wayne Arnold of A-1 and Skyline, Tabby Melvin of Universal Dermatology, and Travis Mick of Prime Meats. Michael Schappacher’s reserve grand champion dairy feeder sold for $1,500 at the Fayette County Fair Dairy Feeders Sale on Friday evening. Schappacher is pictured with buyers and fair royalty: (front row) Dairy Princess Chloe Lambert, Fair Attendant Susanna Eckstein, Diane Faris Munro of Faris Insurance, Fair Attendant Clare Sollars, Fair Queen Marissa Sheets, (second row) Debbie Havens of Havens Landscape, Buck Minyo of LCNB, (last row) Ryan Garrison of Melvin Stone, Keith Tooill of McDonald’s of Fayette County, Mark Richards of First State Bank, Fayette County Auditor Aaron Coole, Tabby Melvin of Universal Dermatology, and Wayne Arnold of A-1 and Skyline. 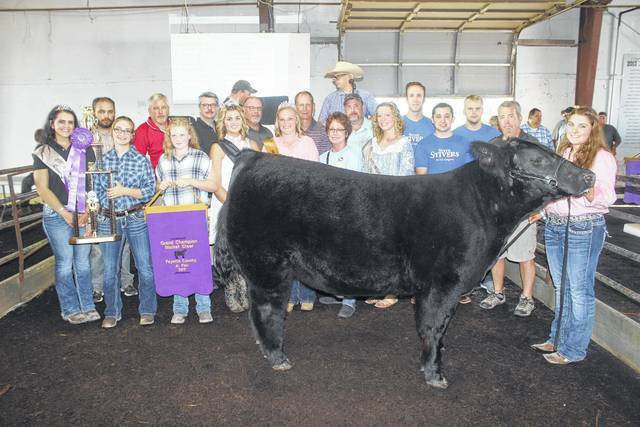 Macie Riley’s grand champion beef feeder sold for $2,900 at the Fayette County Fair Beef Feeder Sale on Friday evening. Riley is pictured with buyers, family and fair royalty: (front row) Fair Attendant Skylynn Barden, Gracie Zimmerman, Garrett Zimmerman, McKenzie Riley, Beef Queen Lindsey Worley, Fair Queen Marissa Sheets, (back row) Mike Rife of Rife Show Cattle, Larry Dean of the Elks, and David Duff of Duff Farms. 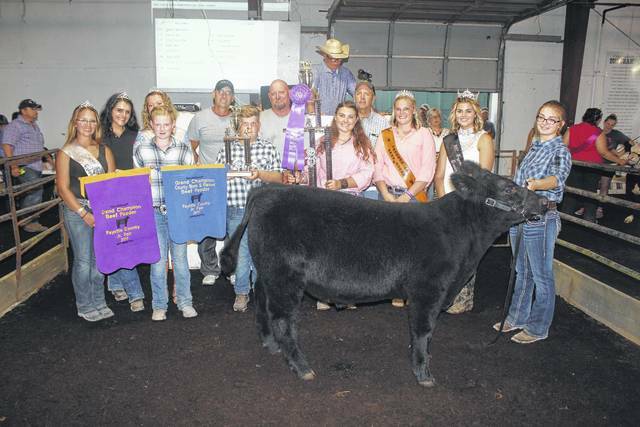 McKenzie Riley’s reserve grand champion beef feeder sold for $1,700 at the Fayette County Fair Beef Feeder Sale on Friday evening. Riley is pictured with buyers, family and fair royalty: (front row) Fair Attendant Skylynn Barden, Macie Riley, Gracie Zimmerman, Garrett Zimmerman, (back row) Fair Attendant Clare Sollars, Fair Attendant Susanna Eckstein, and Jeff Smithson of Jefro Enterprise. https://www.recordherald.com/wp-content/uploads/sites/27/2017/07/web1_IMG_9428.jpgMcKenzie Riley’s grand champion beef steer sold for $5,000 at the Fayette County Fair Beef Steer Sale on Friday evening. Riley is pictured with buyers, family and fair royalty: (first row) Fair Attendant Susanna Eckstein, Macie Riley, Gracelyn Zimmerman, Fair Queen Marissa Sheets, Beef Queen Lindsey Worley, Sheila Johnson of Kroger, Fair Attendant Clare Sollars, Devin Bilski of Congressman Steve Stivers’ office, Fayette County Commissioner Tony Anderson, (back row) Fayette County Prosecutor Jess Weade, Shane McMahon of McMahon Insurance, Keith Tooill of McDonald’s of Fayette County, Buck Minyo of LCNB, Jim Gusweiler of Gusweiler, Travis Mick of Prime Meats, Adam Rapien and Chase Enochs of Congressman Steve Stivers’ office. https://www.recordherald.com/wp-content/uploads/sites/27/2017/07/web1_IMG_9430.jpgVictoria Waits’ reserve grand champion beef steer sold for $2,500 at the Fayette County Fair Beef Steer Sale on Friday evening. Waits is pictured with buyers and fair royalty: (front row) Ashton Bain, Beef Queen Lindsey Worley, Fair Queen Marissa Sheets, Fair Attendant Clare Sollars, Fair Attendant Susanna Eckstein, (second row) Shane McMahon of McMahon Insurance, Daryl Waits of Fayette Veterinary Hospital, Jim Gusweiler of Gusweiler, and JL Draganic of Fayette County Cattlefeeders. https://www.recordherald.com/wp-content/uploads/sites/27/2017/07/web1_IMG_9435.jpgVictoria Schappacher’s grand champion dairy steer sold for $1,700 at the Fayette County Fair Dairy Steer Show on Friday evening. Schappacher is pictured with buyers and fair royalty: (front row) Dairy Princess Chloe Lambert, Fair Attendant Susanna Eckstein, Diane Faris Munro of Faris Insurance, Fair Attendant Clare Sollars, Fair Queen Marissa Sheets, Shane McMahon of State Farm, (second row) Devan Bilski of Congressman Steve Stivers’ office, Tabby Melvin of Universal Dermatology, Fayette County Prosecutor Jess Weade, Buck Minyo of LCNB, (last row) Mark Richards of First State Bank, Adam Rapien and Chase Enochs of Congressman Steve Stivers’ office, Jared Hoop of Baxla Tractor, Jim Gusweiler of Gusweiler, Ryan Garrison of Melvin Stone, Wayne Arnold of Skyline and A-1, and Travis Mick of Prime Meats. https://www.recordherald.com/wp-content/uploads/sites/27/2017/07/web1_IMG_9440.jpgAbigail Riley’s reserve grand champion dairy steer sold for $1,600 at the Fayette County Dairy Steer Show on Friday evening. 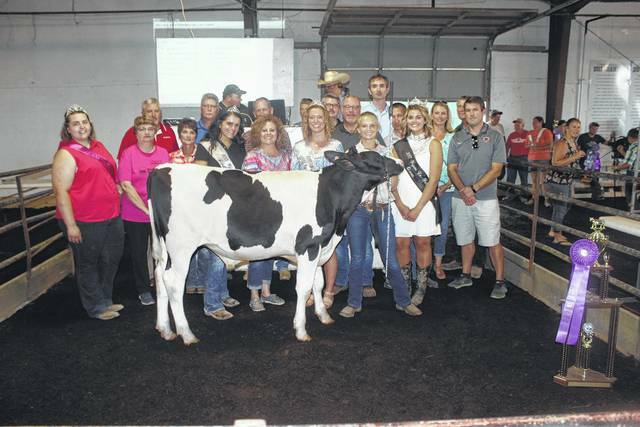 Riley is pictured with buyers and fair royalty: (front row) Dairy Princess Chloe Lambert, Fair Attendant Susanna Eckstein, Diane Faris Munro of Faris Insurance, Fair Attendant Clare Sollars, Fair Queen Marissa Sheets, (second row) Devan Bilski and Chase Enochs of Congressman Steve Stivers’ office, Ryan Garrison of Melvin Stone, Buck Minyo of LCNB, Daryl Waits of Fayette Veterinary Office, Jared Hoop of Baxla Tractor, (back row) Keith Tooill of McDonald’s of Fayette County, Mark Richards of First State Bank, Shane McMahon of State Farm Insurance, Adam Rapien of Congressman Steve Stivers’ office, Fayette County Auditor Aaron Coole, Tabby Melvin of Universal Dermatology, Wayne Arnold of A-1 and Skyline, and Travis Mick of Prime Meats. https://www.recordherald.com/wp-content/uploads/sites/27/2017/07/web1_IMG_9442.jpgAnita Pursell’s grand champion dairy feeder sold for $1,550 at the Fayette County Fair Dairy Feeders Sale on Friday evening. Pursell is pictured with buyers and fair royalty: (front row) Dairy Princess Chloe Lambert, Barb Duncan of Merchants Bank, Debbie Havens of Havens Land, Fair Attendant Susanna Eckstein, Diane Faris Munro of Faris Insurance, Fair Attendant Clare Sollars, Fair Queen Marissa Sheets, (second row) Buck Minyo of LCNB, Daryl Waits of Fayette Veterinary Hospital, Ryan Garrison of Melvin Stone, (back row) Shane McMahon of State Farm Insurance, Mark Richards of First State Bank, Jim Gusweiler of Gusweiler, Fayette County Auditor Aaron Coole, Wayne Arnold of A-1 and Skyline, Tabby Melvin of Universal Dermatology, and Travis Mick of Prime Meats. 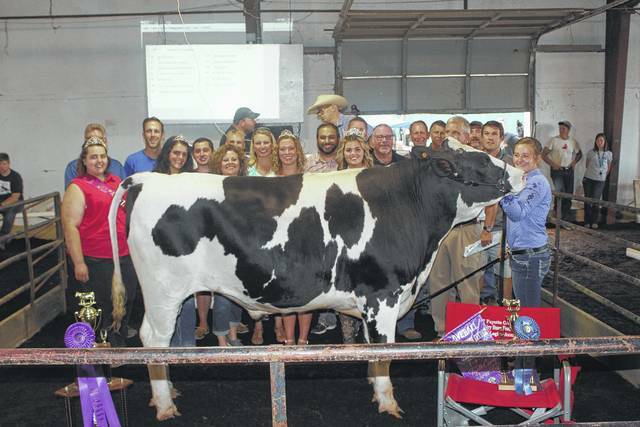 https://www.recordherald.com/wp-content/uploads/sites/27/2017/07/web1_IMG_9445.jpgMichael Schappacher’s reserve grand champion dairy feeder sold for $1,500 at the Fayette County Fair Dairy Feeders Sale on Friday evening. Schappacher is pictured with buyers and fair royalty: (front row) Dairy Princess Chloe Lambert, Fair Attendant Susanna Eckstein, Diane Faris Munro of Faris Insurance, Fair Attendant Clare Sollars, Fair Queen Marissa Sheets, (second row) Debbie Havens of Havens Landscape, Buck Minyo of LCNB, (last row) Ryan Garrison of Melvin Stone, Keith Tooill of McDonald’s of Fayette County, Mark Richards of First State Bank, Fayette County Auditor Aaron Coole, Tabby Melvin of Universal Dermatology, and Wayne Arnold of A-1 and Skyline. 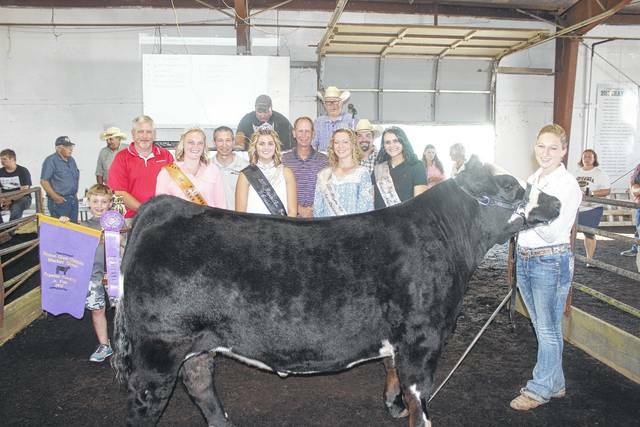 https://www.recordherald.com/wp-content/uploads/sites/27/2017/07/web1_IMG_9452.jpgMacie Riley’s grand champion beef feeder sold for $2,900 at the Fayette County Fair Beef Feeder Sale on Friday evening. Riley is pictured with buyers, family and fair royalty: (front row) Fair Attendant Skylynn Barden, Gracie Zimmerman, Garrett Zimmerman, McKenzie Riley, Beef Queen Lindsey Worley, Fair Queen Marissa Sheets, (back row) Mike Rife of Rife Show Cattle, Larry Dean of the Elks, and David Duff of Duff Farms. 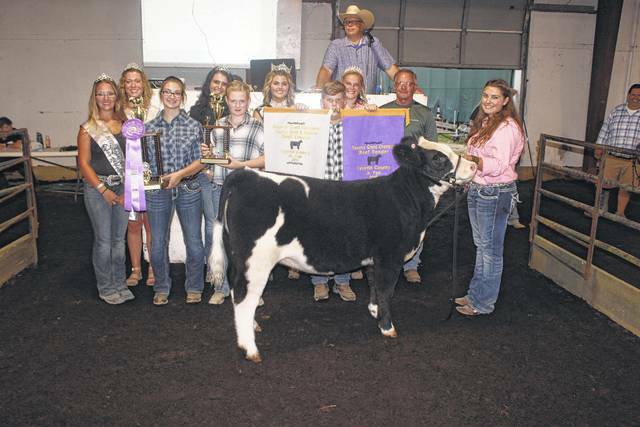 https://www.recordherald.com/wp-content/uploads/sites/27/2017/07/web1_IMG_9455.jpgMcKenzie Riley’s reserve grand champion beef feeder sold for $1,700 at the Fayette County Fair Beef Feeder Sale on Friday evening. Riley is pictured with buyers, family and fair royalty: (front row) Fair Attendant Skylynn Barden, Macie Riley, Gracie Zimmerman, Garrett Zimmerman, (back row) Fair Attendant Clare Sollars, Fair Attendant Susanna Eckstein, and Jeff Smithson of Jefro Enterprise.